In-N-Out Burger or Five Guys? Leave a comment now! I’ve eaten In-N-Out Burger before and I’ve eaten Five Guys before… but this was my first time to ever eat them back to back. In this video I’m taking you on a full burger review comparison between In-N-Out and Five Guys, two burger chains with extremely loyal followings. I ordered the Double Double and extra crispy fries. Now to keep things consistent for the review, I couldn’t go all crazy with their secret menu of toppings, so all I ordered was extra onions. The Double Double from In-N-Out is indeed extremely tasty and salty and it has an amazing balance of tastes and everything goes together in such harmony. However, after finishing the Double Double I walked away still quite hungry. Next we drove over to Five Guys, luckily just a 5 minute drive from In-N-Out Burger. Again, I kept it pretty simple and just ordered their cheeseburger all the way, and a side of regular fries. You’ll notice immediately that the prices are twice as high as In-N-Out, however, we’ll find out that their burger weight probably twice as much as well. The Five Guys Cheeseburger is heavy and dense, and they already press down the bun for you, so it’s not fluffy at all. The ingredients inside are great, and I especially enjoyed the mushrooms inside. The burger is definitely not as salty as In-N-Out, however it tastes better quality. It sort of depends on what mood you’re in, and you do have to take into account that Five Guys is twice as expensive as In-N-Out - so you could eat two Double Doubles for the same price as one Five Guys cheeseburger. 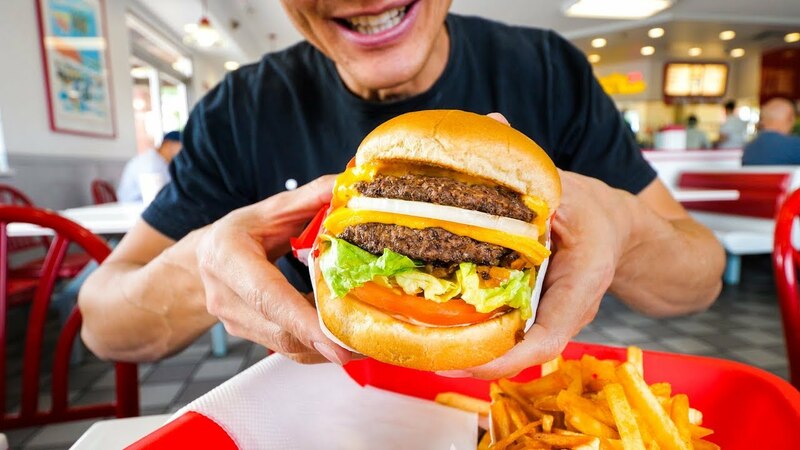 I think the In-N-Out Double Double is tastier, possibly because it’s saltier, but the Five Guys burger tastes fresher, more natural, and a little more home-cooked styles. Overall, I would choose Five Guys more often than In-N-Out Burger. That’s my final verdict. What about you? I’d love to hear your thoughts in the comments below!